Here’s a nice early Christmas present for precision shooters. 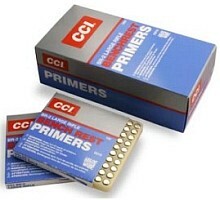 Quantities of CCI small and large rifle primers (including BR2 and BR4) have arrived at many of the more popular vendors. Wolf primers are in decent supply and we’re starting to see Remington primers on the shelves. Federal primers are still very hard to find. Shown below are some available rifle primer inventories as of December 16, 2009. NOTE: Product availability and pricing subject to immediate change. If you need primers, act quickly — this stuff may all be gone in a couple days. REM 9.5 LARGE RIFLE primers — IN STOCK at $44.96 per 1000 primers. Share the post "Attention Shoppers — Get Your Primers Now…"